Bernie M. Farber is the former chief executive oﬃcer of the Canadian Jewish Congress and a social activist. He has testified before the Canadian courts as an expert witness on hate crime, and in August 2015 he was appointed CEO of the Mosaic Institute, a Canadian NGO that promotes pluralism, peace and conﬂict resolution internationally. He has written on human and civil rights issues and the holocaust for New York Times, Washington Post, the Globe and Mail, National Post, Toronto Star, the Huﬃngton Post, NOW Magazine, as well as other newspapers across North America. 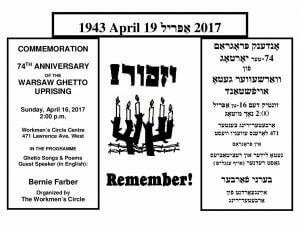 The Toronto Workmen’s Circle annual commemoration of the Warsaw Ghetto Uprising is our way of honouring those who perished in that heroic stand against Nazi brutality. But, more than that, it is our opportunity to show that we are honouring our pledge never to forget the martyrs of the Uprising and, indeed, to ensure that their inspirational story is known by successive generations therefore invite you to attend this year’s commemoration of the Uprising yourself, of course. But we also urge you to bring family members and friends –especially the younger ones – to join us for an event that promises to be a deeply moving and informative experience.